RECENT MOVE - UNL's Employee Assistance Program moved into the Wells Fargo Building, 1248 O St., on April 1. 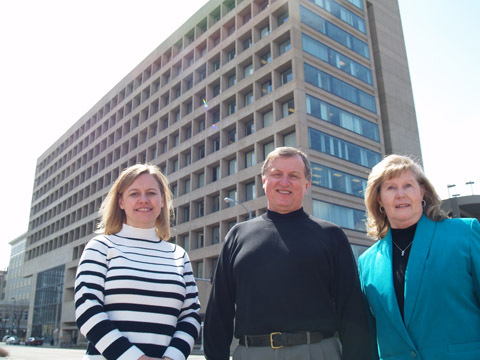 Pictured in front of the building are EAP's Kyla Dose, Floyd Sylvester and Carol Nau. Photo by Troy Fedderson/University Communications. Floyd Sylvester knew office space was at a premium on campus - he just didn't know how tight the "market" had become. Textiles scientist Patricia Cox Crews will discuss how quilts reflect American culture and the lives of quilt makers during an April 17 Nebraska Lecture. Chuck Francis envisions a new paradigm for secondary education that blows typical notions of classroom learning out of the water. As part of Graduate and Professional Student Appreciation Week (March 31 to April 4), the Graduate Student Association organized an April 4 kickball game that was to match graduate students against faculty. UNL ROTC cadets took part in an April 3 training mission to "rescue" a downed pilot on the grounds of Doane College in Crete. Flying on UH-60 Black Hawk helicopters - piloted by members of the Nebraska Army Air National Guard - the cadets set up an ambush for "enemy" troops, secured a communications tower, and rescued the pilot. The public was also invited to attend the event, after which Capt. Rob Ford, affiliate with Military Science, discussed the exercise with youth who attended. The College of Agricultural Sciences and Natural Resources will celebrate CASNR Week April 12-19. The theme, "Fulfill your Fate in '08" celebrates students opting to earn an education through CASNR. Dave Gosselin, professor School of Natural Resources, talks with Harsha Ariyarathna, Food Science and Technology graduate student, about her research poster during the April 2 graduate student poster session at the annual UNL Research Fair in the Nebraska Union Ballroom. Photo by Brett Hampton/IANR News Service. A ground breaking new Web site, eXtension.org, offers a gateway into some of the nation's leading expertise on just about any topic one can imagine. Karrie Ziemba didn't feel healthy. Institutional Research and Planning has gone digital in keeping track of campus room use. The University Libraries is celebrating National Library Week (April 14-18) by collaborating with other departments to sponsor a variety of events - including a poetry slam and a lecture on climate change. All events are free and open to the public. The MFA Thesis Exhibition III includes this sculpture, "White Athabaska III," by Xanthe Isbister. The exhibit is open through April 11 in the EisentragerHoward Gallery in Richards Hall. Others showing work include Susan Dewsnap and Anne Ruehrmund. Enrique Martínez Celaya, a University of Nebraska Presidential Professor (2007-2010), will visit UNL April 14-18. He also visited UNL in the fall. Visitors to the Sheldon Museum of Art examine the "Luis Gonzalez Palma: Metaphors of the Heart" exhibition. The photography exhibit is open through June 1. For more information, go to www.sheldonartgallery.org. Photo by Tom White/Sheldon Museum of Art. University Theatre closes the 2007-2008 season with "The Unvarnished Truth," a dark comedy. Shows are at 7:30 p.m. April 17-19 and April 23-26 in the Temple Building's Howell Theatre. John Trudell, a poet, recording artist, actor and activist will present two lectures and a book signing on April 16. A guest of the Institute for Ethnic Studies and Native American Studies, Trudell will lead a colloquium at 3 p.m. in the Nebraska Union (room posted). A book signing will follow from 4 to 5 p.m. At 7 p.m., Trudell will give the lecture "Give Love, Give Life" in the Nebraska Union Crib. Life in communist Romania comes to life in "4 Months, 3 Weeks and 2 Days," opening April 11 at the Mary Riepma Ross Media Arts Center. The American poet Elizabeth Bishop often wrote of how places - both familiar and foreign - looked, how they seemed. Here Marianne Boruch of Indiana begins her poem in this way, too, in a space familiar to us all but made new - made strange - by close observation.